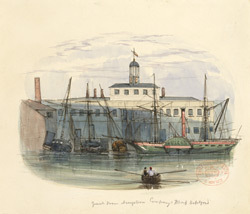 In 1643, the East India Company moved its manufacturing base away from Deptford. It leased its land to a host of smaller shipping businesses. In the late-18th and early-19th centuries, this land was sold outright. One of the greatest beneficiaries was the General Steam Navigation Company, which was set up along Deptford Creek in 1820. It quickly began to challenge the Clyde Shipping Company in Scotland as the biggest commercial steamship company in Britain. It specialised in ocean-going steamships for long journeys, and by 1840 it had built and owned 40 of them. The company prospered well into the 20th century, despite the shift in Deptford's industrial emphasis from shipping to electricity.